Dean Markley Blue Steel strings are cryogenically frozen with a blast of liquid nitrogen. By freezing the strings down to -320ºF, we tighten the molecules, minimizing microscopic gaps. This process removes transient frequencies that produce harsh highs and muddy lows, creating a more consistent string, with true tone and longer life. 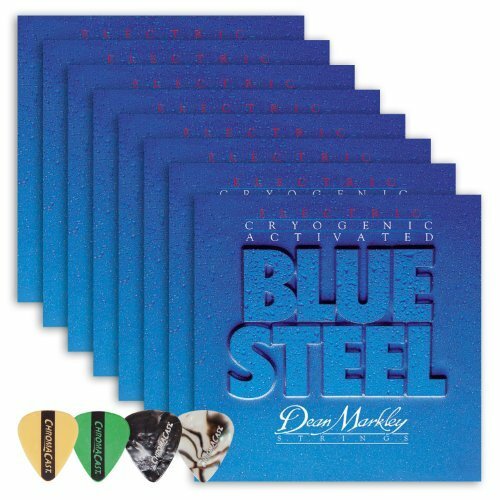 Made of 8% nickel-plated steel outer wrap on tinned Mandolin wire hex-core, Blue Steel strings have been top-sellers for years and are used by pros worldwide. Once you try Blue Steel strings you'll be hooked. They feel great, ring true, are durable and long-lasting, and they just plain sound good. Includes ChromaCast Pick Sampler. DuraPicks & Celluloid Picks in assorted colors and gauges. If you have any questions about this product by Dean Markley, contact us by completing and submitting the form below. If you are looking for a specif part number, please include it with your message.